How to insert image into the email? Can I make attachment on the email? Can I edit the HTML source directly in the email? How to organize/group the Email Address? How to import Email Address? How to remove email address from RoboMail? Can I hide some columns in the Address Book? How to setup the Unsubscribe feature? In Email Template, switch to "Emails to send" tab. (1) Click the "Add From Address Book" button to add address group from Address Book. (2) Click the "Add Email Address" button to add email address directly. Click the "Add From Address Book" button. You can choose which group of address is added to the template. Select the group on L.H.S. and click the arrow button to move to the R.H.S. After making the selection, click "Save" button. In the main window, you should find the number of "Not Send" of your template is updated. 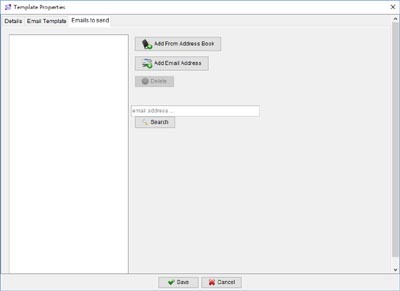 Click the in Tool Bar to start Email Sending. In the popup window, you can specify the "Starting Time" and "Stopping Time". Click "OK" button to start. You can see the "Start" and "Stop" button is toggled.